If you’ve been reading my blog, you’ll know I recently got my hands on an Arduino, which means learning a new programming language, C! After playing around for a couple of weeks and getting to grips with the language, I put together a nice little project which I thought would make a great tutorial! 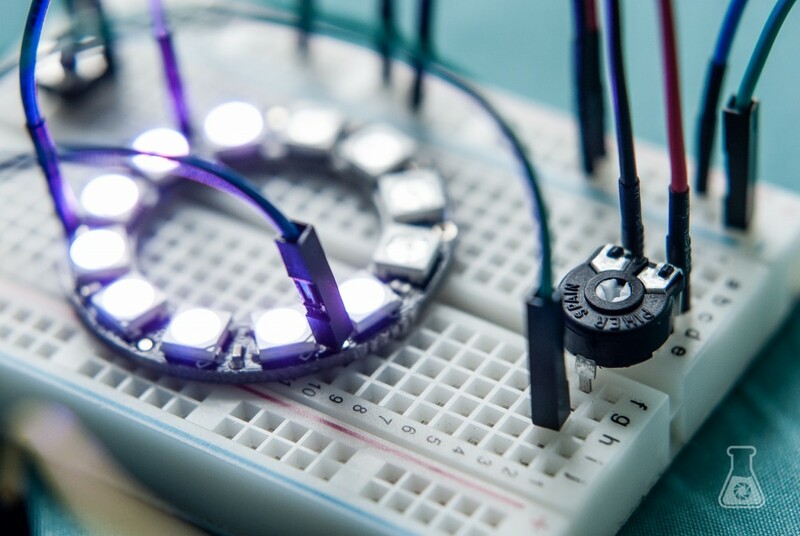 This simple, yet really cool project will show you how to control the colour as well as number of LEDs lit up on Adafruit’s Neopixel LED rings using a single potentiometer, and a push button! The potentiometer is the key component for this project! It is essentially a variable resistor, which is controlled by twisting the centre dial using a screwdriver. They come in a variety of forms, ranging in maximum resistance value and response (linear or logarithmic). Wiring this project up is pretty trivial, the schematic makes it quite clear I think. The important concept to understand here, is that the wire from the switch to the Arduino, must go to one of the ADC (analogue to digital converter) pins, and must be on the side of the switch connecting to GND. A resistor connects the switch to the GND, to ensure when the button is not pressed, the value is as close to 0 V as possible, on the ADC pin. Before we can upload our code to the project, we’ll need Adafruit’s Neopixel library. You can download the library from here, where there are instructions on how to install the library. With the library installed, you can then upload my code to your Arduino board to run. You can download the code from my GitHub page, or copy it from below. Currently, the code is set to only control the red and blue portion of each pixel. You can change this if you like, by adding the variable `var` in place of `y` in the `strip.setPixelColor(x,255,y,225);` statement. If you’ve wired it all up correctly, and uploaded the code, you should have your project up and running! 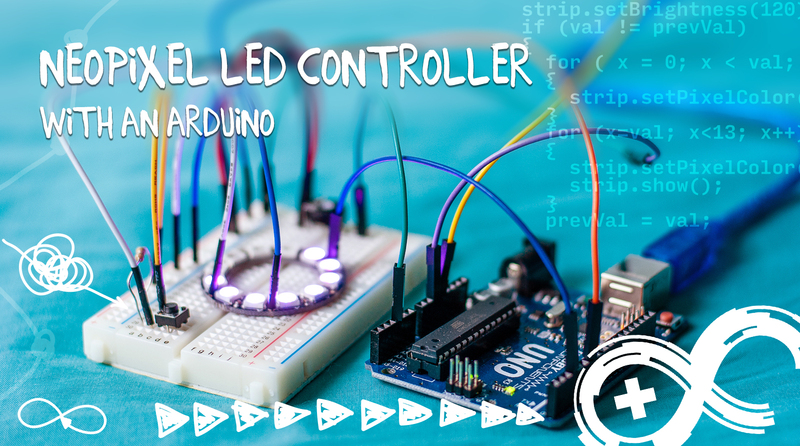 Using a screwdriver, twist the potentiometer to control the number of LEDs lighting up. Press the button once, to switch to controlling the LED colours. Now the potentiometer will control the LED’s colour. Press the switch again to switch back to LED number mode! Cool, isn’t it? There’s a cool vine below showing you how this should work in practice! I hope you enjoyed this tutorial! If you have any issues, please drop me a comment below and I’ll be happy to help! But I can’t seem to find any ref to strip.setPixelColor(x,255,y,225)? Hope this solves your problem and it works nicely with your set up! Glad to you know you like my work! Are you interested in using this particular project with a Gemma? I’ll look into it and see how it could work, and get back to you soon! As for controlling both parameters without a switch, would you prefer an alternative? Because otherwise, you’d be changing both things at the same time..
Hey sorry for the late reply! 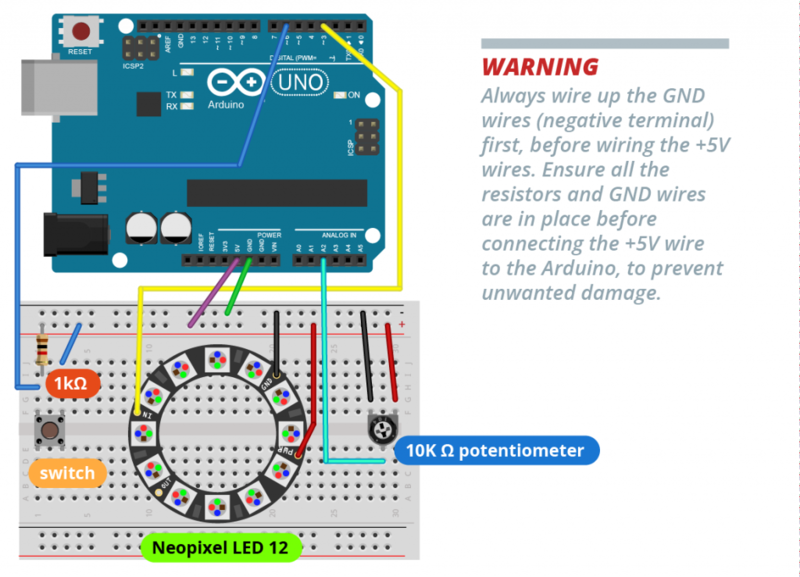 The potentiometer would need to share the GND pin of the Gemma, so if you could link two wires from the Neopixel and the potentiometer by soldering, and then connect it to the Gemma? Or however else you prefer. The other pin of the potentiometer, would connect to the 3.3V (3Vo) pin of the Gemma. These are the two outer PINs. The inner PIN of the potentiometer would then connect to D2 / A1 of the Gemma. This is the same PIN, labelled on either side, and is the only analog input pin on the Gemma. As you change the potentiometer, the number of LEDs and their colour will vary at the same time. Thanks! 🙂 And sorry for the late reply! There wouldn’t be much difference in the coding, just some slight changes. I’ll put a code snippet here by tonight showing you how it will look! If it is this controller you are using -> https://www.adafruit.com/product/1501 , then do you mean that there are only 4 GPIO pins? The pin for the potentiometer (potPin) would need to be set to one of the analog pins (GPIO #2 / 3 / 4). So if you connect it to GPIO #2, you don’t need to change the code for that. The switch pin will needed to be changed, to for example GPIO #0. Change the code to read `int SwitchPin = 0;`. The could should then run fine! Note, you will need the 5V Trinket, as the Neopixel LED ring requires 5 V to run. Any tips for doing a very similar project, but with a circular soft potentiometer? It has three pins, but they can’t be configured the way yours are here. Sorry for the delayed response! I’m not sure how this potentiometer differs from mine, looking at the description I think it should work in an identical way. You’ll just need to make sure you use the appropriate resistors to ensure you don’t overload the current on your Arduino. The only difference as I can see is the three pins are on the same side. Let me know! Sorry for the very delayed response, as I only just noticed this comment now! I’m not sure if I understood you correctly, but if I did, is it not simply a matter of putting a timer that is 20 minutes * the number of LEDs you’re using? So every 20 mins, an LED will go off? I am completely new to this and of an age when calculators/computers were not everyday items. I have a Trinket 5V and a Arduino Nano. What I would like to do is to be able to use 2 neopixel strips and be able to turn on either board so that I get a continuous colour and then using a momentary switch be able to change the colour of the leds. I.E turn on board and all leds are red – push button and all leds are blue – push button and all leds are yellow etc etc etc. I have put some codes together and can only manage to do this by re-writting my codes each time and the only switch codes I can find I do not understand. Any help for an older student would be highly appreciated. I would prefer to use the Trinket as its smaller. Glad to hear you’re liking the projects! What you want to do is definitely possible! I can point you in the right direction, or otherwise just provide you with the correct code. I’ll start with pointing you in the right direction! To cycle between these states, you can use the switch case function of the Arduino language (https://www.arduino.cc/en/Reference/SwitchCase). Just set up a ‘case’, each one calling a different function to produce the effect you want. Each case can be numbered, so that when you press the button, it cycles through the numbers 0,1,2, etc. of your switch case. When it reaches the end of your switch case, you need to reset the number back to 0. If you download the library on this page (https://learn.adafruit.com/adafruit-neopixel-uberguide/arduino-library-installation), there’s an example called buttoncycler.ino in the example folder, which does precisely what you describe. Let me know if you need more help! Great explanation but I am new to arduino and i am having a problem. for some reason my button doesn’t seem to do anything. I have changed the code to include a 60 neopixel ring but thats the only change I have made and I am pretty sure the wiring is correct. the potentiometer is changing the amount of neopixels that are on but i cant change the colours. I hope you can help, thanks. Hi Gary, Glad you liked the tutorial! Maybe your button isn’t working? When you press the button, the potentiometer should no longer change then number of LEDs lit up when adjusting it. Do you notice that it stops responding when you press the button? If not, that means the expression `digitalRead(switchPin)` isn’t registering a `HIGH` value. Could you test the button out with a simple code example? Check that the pin number you are using is also working on your board? Thanks for getting back to me. It appears that my button isn’t working, would you have a code to change the colour of the neopixels using a potentiometer? I have been trying but appear to be going wrong somewhere. Hi Gary, the following code should do what you need! Thanks Ismail for your help and the quick response time, its working now! I want this addon to my MirrorBooth. Unfortunately I don’t have any sample code, as this would be quite a length project to put together! Hope this helps! Also, I have no idea what lastButton is? I hope that makes sense…like what is the LAST button pertaining to? Ahh haha, good spot! That is a bit of relic from an older version of this code where I was trying to account for the contact debounce. If you’re not familiar, it’s this effect by when you press a button and release it, it bounces a bit registering a second ‘press’ to the microcontroller. In the end, I found it was much simpler to just put in a short delay in the code. So yea, you can just ignore that!